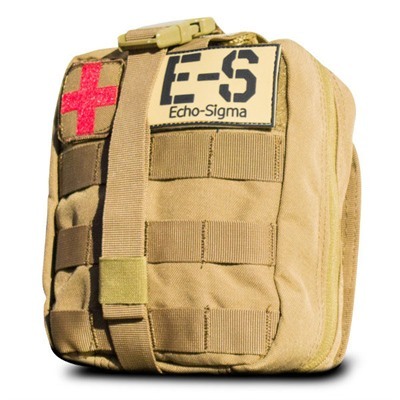 Compact EMT pouch contains the necessary tools to stabilize life-threatening, traumatic injuries. Supplements a conventional first aid kit and prepares you to deal with a scarcity of medical help during a widespread emergency. With a quick grab, the pack opens to provide immediate access to its life-saving supplies, including a combat tourniquet, 35g of Celox® hemostatic agent, NAR 6" emergency trauma dressing, compressed gauze, trauma shears, 2 rolls of adhesive tape and 2 pairs of Black Talon nitrile gloves. Also contains an Adventure Medical Suture/Syringe Kit that consists of an additional pair of gloves, an 18-ga angiocatheter, 18-ga x 1½" needle, 21-ga x 1½" needle, 25-ga x 5⁄8" needle, nylon suture 5-0, 1cc syringe with needle, Luer Lok 3ml syringe, three anethestic/antiseptic wipes, and four alcohol swabs. Ships directly from manufacturer. Please allow 7 additional business days for shipping.